For the first time in 50 years, the Department of Health and Human Services (HHS) is recommending a change in the fluoridation of water. Currently, a range of 0.7 to 1.1 milligrams per liter of water is recommended, and the Environmental Protection Agency (EPA) has a maximum allowable amount of 4 mg/liter. The proposal, which would recommend all drinking water have less than 0.7 mg/liter, is a reaction to a 2006 study by the National Academy of Science showing that excessive fluoridation can lead to dental fluorosis in children younger than eight. Dental fluorosis causes teeth staining in its mildest form, but more serious cases can result in enamel damage and pitting of the teeth, both of which can have adverse health impacts. It specifically affects children because it only occurs when the permanent teeth are developing under the gums. HHS expects to provide final recommendations in Spring 2011, but there are actions you can take today to protect your family from fluorosis. The CDC offers the following guidelines. 1. 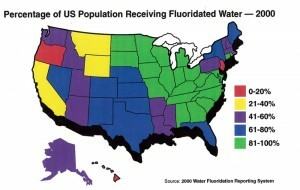 Check with your local water company to find out the fluoride concentration of your drinking water. If it is more than 2 mg/liter, use an alternative source of water. 3. Do not use toothpaste for children younger than 2 years old. Once the first tooth emerges, it should be gently brushed with a soft toothbrush and plain water. 4. Supervise tooth brushing until age 6 to avoid accidental swallowing of a large amount of toothpaste. Limit the toothpaste to a pea-sized portion.